Bean to bar chocolate in Manchester! 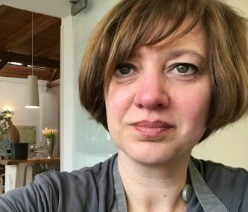 Here is my interview with the lovely Isobel from Dormouse Chocolates. Last month I attended the level 1 and level 2 courses run by The Institute of Chocolate Tasting, the brainchild of Martin Christy, Monica Meschini and Maricel Presilla (founding partners of The International Chocolate Awards). These courses are now officially accredited and an exceptional way to gain knowledge, as well as qualifications, in chocolate. I will write about them fully in a future post. I reference them here as the experience showed me what an extraordinary and developing community of people now work in chocolate. Interest is dedicated and worldwide, as shown by the attendees on the courses. From Korean pastry chefs, via Canadian connoisseurs, to Mexican tree-to-bar chocolate makers, the world of fine chocolate is growing apace. Some happy evidence of this are the growing number of bean to bar chocolate makers I meet on my travels. And I am always happy to find chocolate makers in the UK to follow. The micro-batch movement is making this an increasingly frequent occurrence. 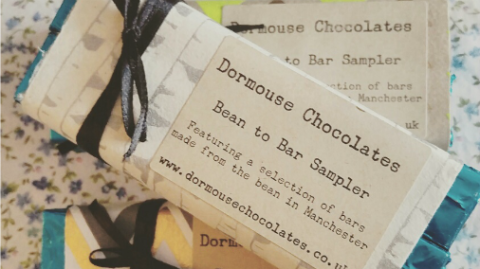 One such is Dormouse Chocolates, based in Manchester, who create intriguing flavours with couverture and bean to bar work. 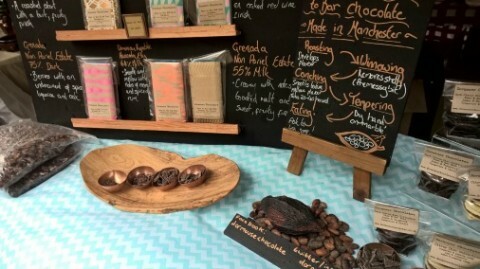 Their striking moulds caught my eye at last year’s Chocolate Show in London, and I’ve been looking forward to finding out more about Isobel, Dormouse Chocolate’s chocolate maker, and her creations. It was great to taste your chocolate at The Chocolate Show in London last year. I don’t know how you came to be a chocolatier, and importantly a bean-to-bar chocolate maker. Tell me about your life before chocolate. When and why did you decide to stay working with chocolate? When Hotel Chocolat decided to recruit chocolatiers to work in their restaurants and cafes it seemed like the perfect job opportunity for me! 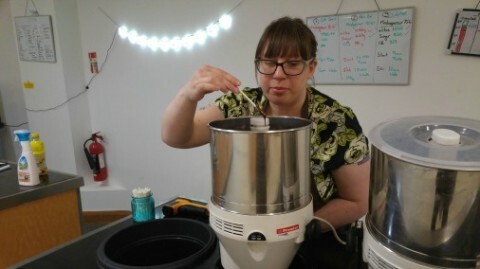 My application was successful and I spent a summer training in their development kitchen learning predominantly about bean to bar chocolate making. After spending a year travelling around the various sites I decided that it was time to spend some time at home and set up Dormouse Chocolates with the support of my partner Karen. Tell me a bit about how you make your chocolates? We also produce a range of flavoured bars and discs which are made with specially selected single origin couverture, all flavoured by hand with natural oils, fruits and nuts. This is where my more creative side comes out and I get to play around with flavours and textures. The story of bean-to-bar, by Dormouse. You have a great range of flavoured bars, tell me how you go about it? Tell me a bit about starting your own business. What have been some of your greatest discoveries? Tell me a little about where you are based. Where do you work and where do you sell your chocolate? We’re based in Manchester and are really excited to have just moved in to a new kitchen! 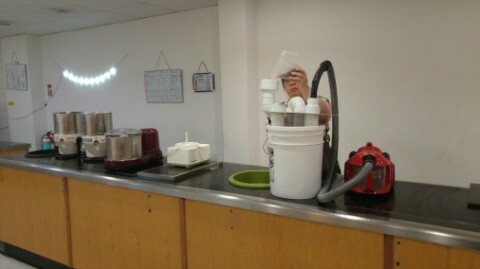 It is at the Old Granada Studio building and we have moved into what was the staff canteen when the studios were open. We are hoping that once we are fully settled we will be able to invite people in to see how we make our chocolate and experience the full bean to bar journey. We mostly sell through farmers markets in Manchester and Cheshire (and occasionally London! 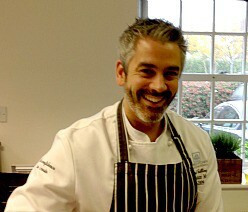 ), our website www.dormousechocolates.co.uk has the full listings of where to find us. 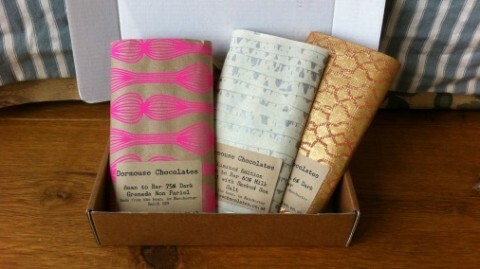 We also sell online at http://dormousechocolates.bigcartel.com/ and through select coffee shops and delis. Isobel tends to the chocolate. More and more people are coming round to the idea that for a bar of chocolate to be cheap something has to be going wrong at some point in the supply chain. One of the great things about selling to people through farmers markets is that we can talk to our customers and explain where our beans have come from, and why our bars cost that bit more than the ones in the supermarket. I think that we reach a wider audience that way as well, people might not necessarily have come out looking for chocolate but are always happy to stop and try some! People are also becoming more interested in the difference in flavour between different origins. We like to offer samples to people and get them to compare the flavours, it’s always great to see people realise there’s more to chocolate than the mass market stuff they are used to. I think that it will follow a similar pattern to craft ale and coffee, as more people become aware of the craft chocolate movement the number of people making it will grow. As bean to bar gets more publicity we find more people seeking us out, for example whenever Cocoa Runners are on Sunday brunch people come to find us because we are the only bean to bar company locally (thanks Spencer!) and we are always happy to recommend other bean to bar producers to people to help them explore what is out there. Chocolate aside what food do you love? I love cheese! One of the best things about selling through farmers markets is that we get to meet other local producers and try some fantastic produce, quite often we find ourselves heading home with bags full of treats! Has your own palate and feelings about chocolate changed since you started? I’m on a constant mission to keep developing my palate, whenever I go away the first thing I do is seek out the local chocolate maker! I think that it’s important to keep trying new things and by seeking out the best chocolate I hope that it helps me improve what I do as well. 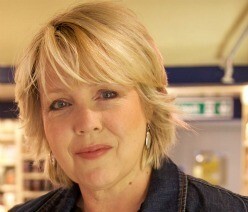 I’ve enjoyed seeing the change in Karen’s attitude towards fine chocolate – she always tells people that before we started Dormouse everything she tried just tasted like “dark chocolate”, now she can tell the difference between different origins and is just as likely as me to go off and hunt for new bars. What is coming next for Dormouse Chocolates? What plans do you have for the chocolate and for the business? In the long term we would like to be able to visit the plantations that we source or beans from! Another goal is to possibly get a storefront, but to open a shop in such a way that people can see the process. In the short term we have been working on bringing new origins and products in to the range, and are looking forward to bringing them to the Chocolate Show again. Can you tell me what your desert island chocolate would be? It can be a bar, filled chocolate, chocolate dessert, anything chocolatey. Argh, that’s too hard! It would definitely be a dark milk with a smooth richness and lots of flavour, but it’s too difficult to narrow down more than that! Either the 60% Peru milk from Chocolate Tree, the 61% Honduras milk from Duffys, or the Brown Butter milk from Fruition… I could go on…. Yes! I know the feeling. Thank you Isobel. I look forward to seeing you at The Chocolate Show in London in October. Beautiful wrappers, beautiful moulding, let’s dive in. 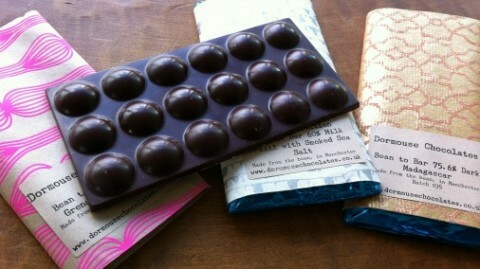 Isobel sent me three of her latest bean to bar chocolates to taste, so that I could bring you some idea of her work. All three were very bright, with lots of acidity, juicy and fresh. They are very beautifully moulded and have a good particle size for a nice fine melt. A 60% Brazil milk chocolate with smoked sea salt has a good whack of salt. It combines citrus and a grassy, herbal quality, with a strong creamy taste. The ending mellows into leather and tobacco notes. An interesting and indulgent chocolate. The 75.6% dark Madagascar from the Sambirano valley opens with a burst of fruit. It is full of raspberry and there is balsamic vinegar in there too. It has a sharp, sherbet quality with a touch of cinnamon. There is quite high astringency with this chocolate, it sets the juices flowing, and so benefits from allowing it to melt slowly. So much of the bright, fruity nature of the beans has been preserved. My favourite chocolate of the three was the Grenada Non Pariel 75% dark. Again this is juicy and astringent, this time with lots of blackcurrant. I also found anise, and the flavour develops a marmalade quality as it melts, combining fruit and a boozy warmth. 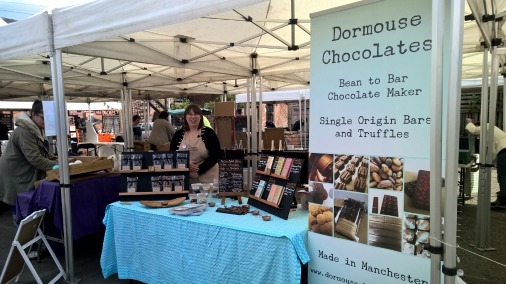 Do check out Dormouse Chocolate online, or visit Isobel at one of the many markets she frequents. You are guaranteed some exciting tastes and a good chat about chocolate!